Need a warm fuzzy? You can make in in two steps! Not only are these cute little critters adorable but they serve many purposes... management tool, prizes, a package topper,etc. I remember making warm fuzzies in school. 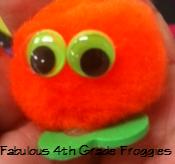 We made them to give a classmate along with a compliment. As a teenager I would make green and red warm fuzzies to stick on Christmas gifts. But now as an adult, I use the same little critters in my classroom daily but we call them Working Wilsons! 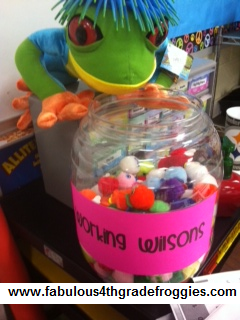 I have a big jar of Working Wilsons that are protected by one of my favorite frogs. :) At random moments throughout the day when all students at desk groups are all on task and/or working cooperatively they earn a couple of Working Wilsons. After a week or sometimes two weeks the "team" that has the most Working Wilsons earns "lunch with the teacher" or any other prize. The students LOVE LOVE LOVE trying to win and they encourage each other to stay on task and do what they should be doing! Hope you can use these critters to help make someone smile, whether it be to go along with a compliment or a top a gift or even as a motivational tool!